The Sword in the Waterfall is a Quest in Final Fantasy XV. It will take you to the Tomb of the Wanderer and the weapon: Swords of the Wanderer. "Talcott, Jared's bright-eyed grandson, shares a legend he learned which tells of a sword behind a waterfall. Believing that this might be the location of a royal tomb, Noctis decides to search for it." Find the cave behind a waterfall. Search for the sword of legend inside the cave. At the hotel, Talcott will tell you about a legendary sword hidden behind a waterfall nearby. Before leaving the town check in with all the shops if you'd like and grab any Side Quests you'd like to explore in the area. Check in with all the diners to get the points of interest well marked. 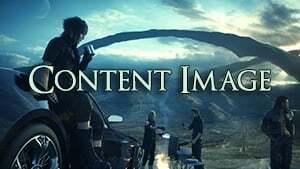 The level of the quest should be a good indication that the game would like you to explore content outside of the main story before proceeding. Head in the car and make you way towards the waterfall, opting to camp if you'd like to prepare some Meals. Down the road from the emporium near here you will find a walkway leading to a trail that heads to the waterfall. Watch out for the Midgardsormr at the bottom of the trail. It's high level and tough so give it wide berth. Near the waterfall you will find some Shieldshear crabs milling about. They are well armored and can hit hard so be sure to get tons of blindside shots in. Dispatch them and find the path leading up to the right of the waterfall to find the entrance of a cave. The cave leads to a Dungeon called the Greyshire Glacial Grotto. Inside you will find several challenging foes including Daemons. As you enter head down the left side to find a Fossil Shell. Around the bend you'll find Flan and not the dessert dish. They are highly resistant to everything except for Holy. Dispatch them and you'll slide down a path to an area of Imps. Take them out with ease, minding the Poison they can inflict. Find the Potion in the corner here and take the narrow path to the top, finding a Rusted Bit to the left. Take the next slope to the pit with the Arachne. Defeat it and take the path to the left with a Hi-Potion. Take the narrow ledge to the right. The room below will have imps and a Fossil Shell. Nearby you will find a dead end path with a Star Pendant and a path back up. On this path you will find a Potion and 3 more Flan, and beyond a bridge with a Carbon Bangle and Ether at the ends. A small crawlspace can be followed for more Fossil Wood and a path on the left leads back to the beginning where an Ammonite Fossil can be found. Across the path you will have several paths you can take. The path left will lead you to an Arachne before a Hi-Potion and beyond a path to an icy room with an Elixir and a dead end where you will find a Phoenix Down. The center path leads to an area with Imps and Arachne and behind them will be a Rusted Bit behind an ice column and an Oracle Ascension Coin at the bottom of the cliff. On the right path by the fire deposit, take out the Flan that spawn. The lower area on the right will have some Imps and a dead end with a Frienship Band. The ledges will lead you to a lightning deposit, provided you avoid the ice slips. On the high ledge by the deposit, you'll find a Fossil Wood. Stick to the right wall and proceed ahead to find more flan and a Ronin. The ronin is a deadly sword wielding enemy that you'll have to carefully anticipate his movements. Beyond you'll find a narrow ledge to go around to a large ominous chamber. A Mindflayer will appear with some Imp mobs. The mindflayers are weak to Polearms and Daggers and lightning. More flan and mindflayers will be summoned to this fight so yay for that. Be sure to keep your team healed and moving. This is a potentially long and protracted bottle but your reward for defeating the group is access to the Tomb of the Wanderer. Inside you will find the next of the Royal Arms, the Swords of the Wanderer and unlock the Armiger Arsenal as well as the Armiger Abilities grid in Ascension. You can now leave the dungeon at your leisure and your journey will continue in The Way of Gods and Kings.